I have been invited to speak [join a breakout panel on legislation] at the Data Transparency conference (2013) in Washington, D.C. next week. My message will be quite simple so that everyone can then focus on the other, very impressive, speakers: Now is the time for Congress to launch Operation Clean Desk. As I have discussed before, the process of legal drafting has built up a lot of cruft over the years. Amendments on top of amendments on top of original Acts. Even politicians who want to reduce the size of government end up doing so by adding to this growing body of overlapping law. Congress saw the fundamental solution to this problem years ago, and created the Office of the Law Revision Counsel, which prepares the U.S. Code (see 2 U.S.C. 285). This is a single, clean, compilation of most of U.S. Federal public law. But until Congress formally enacts the Titles of the Code, these compilations live in parallel with the growing sea of historical laws. The LRC also compiles draft bills that would enact individual Code titles. This process has been called positive law codification, though some (e.g. +Harlan Yu ) have proposed to refer more directly to "enactment of U.S. Code titles". Passing these codification bills would be step 1 of Operation Clean Desk. Step 2 is related: make adjustments to Congressional drafting workflow, so that new laws fit more directly into the existing structure of the U.S. Code. This process is already underway: the Office of Legislative Counsel is well aware of the value of drafting consistency and the new House Rules have focused on consistency and transparency. For example, citations in a bill should make direct references to U.S. Code sections wherever possible. There are also terrific drafting guidelines (e.g. pdf from House Legislative Counsel, 1995) about the language, form and structure of amendments. These drafting guidelines can be updated in practice to work even better with structured data formats (e.g. the U.S. Code in XML, announced by the Speaker's office earlier this summer). I don't mean to prescribe the details of drafting rules here; there are a lot of great minds at the Office of Legislative Counsel and other places in government, who work on this. Some ideas are captured in +Grant Vergottini's blog post on variations of how to represent amendments, including the redlining model used in California. Other ideas (e.g. plain language drafting) can be brought to bear. What I recommend here, is that Congress should give priority to a further standardization of the drafting process itself. I hope you will agree that these are good ideas, albeit not really new ideas. What is new is the timing. The speakers list at the Data Transparency conference suggests why. While no one might have objected before, now there are key leaders in Congress who genuinely care about the technical details. 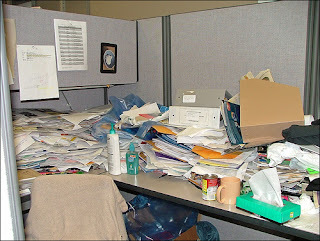 Operation Clean Desk will not get them a lot of press or a lot of invitations to the Sunday talk shows. But they know it needs to happen in order to facilitate a common agenda of transparency and government efficiency. The low profile nature of the LRC's codification bills has often also made them low priority. But these bills are extremely important for the project of government transparency and they need a push. I believe that the high level participants in the Data Coalition conference can come together to give these bills the priority in Congress that they deserve-- despite the lack of lobbying or special interest pressure. At the same time, Congressional offices can be drawn in to the project of drafting standardization. I envision a combination of drafting technologies and education of Congressional staff. This two step process defines Operation Clean Desk for me. And there is no time like the first Data Transparency conference to begin this work. I will be in good company at the conference: House Speaker John Boehner (R), Congressman Darrell Issa (R), Senator John Warner (D), and many others from both sides of the aisle. The conference keynote will be given by U.S. Deputy CTO Nick Sinai.